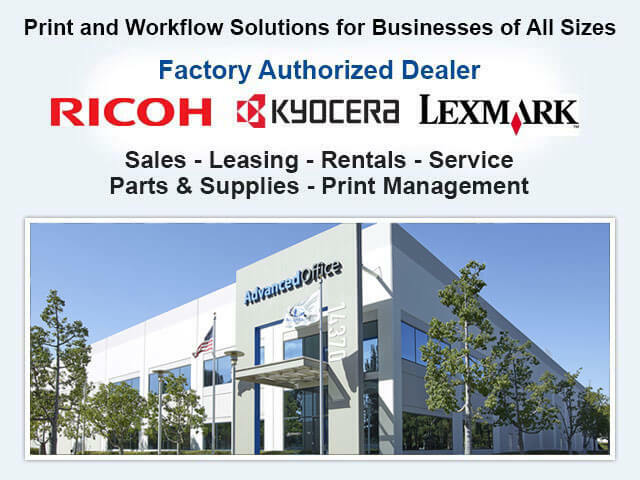 Advanced Office is Pasadena's premier authorized dealer for Ricoh and Lexmark, the industry leaders in high-quality commercial copiers and printers. 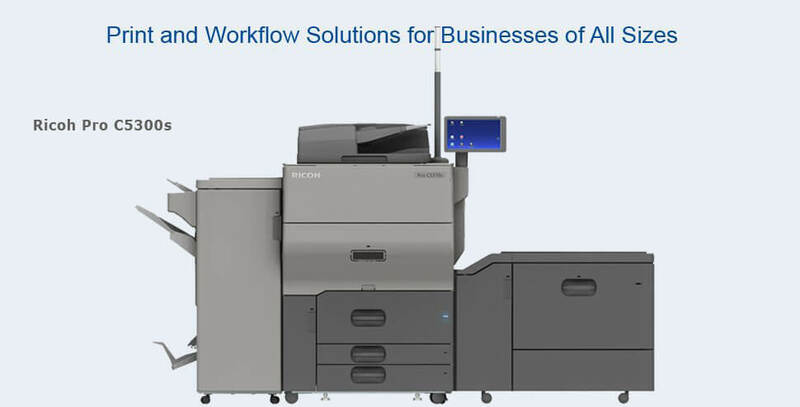 Over the last 30 years, we've provided tens of thousands of Southern California businesses with print and workflow solutions to help them reduce inefficiencies, become more secure, and save money. Our focus on helping our clients find the right copiers and printers for their needs and budgets has been the key to our success. As a result, we have become Ricoh's #1 dealer in their Western Region and reached Lexmark's highest level of dealership. Advanced Office's competitive rates and wide range of financing options make it possible for organizations of any size to afford the Ricoh or Lexmark equipment they need. We sell, lease, and rent all-in-one copiers, multi-function printers (MFPs), single-function printers, digital duplicators, wide-format printers, production printers, and fax machines. We also sell fully refurbished Ricoh copiers. 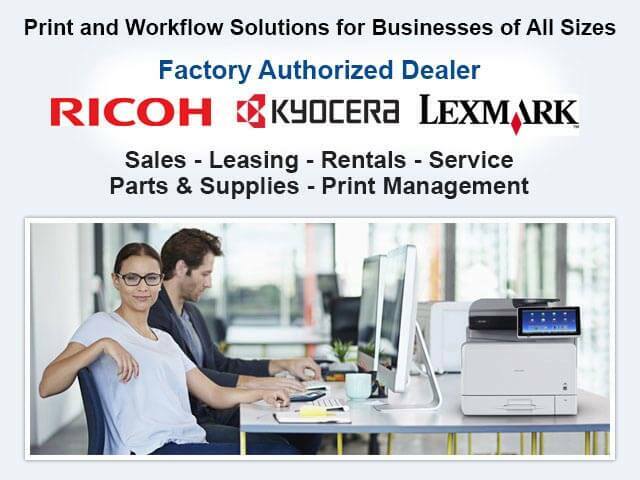 All of our Ricoh and Lexmark products qualify for our exceptional service and maintenance agreements. We offer all-inclusive service and supply agreements as well as parts and labor agreements. Both types of service contracts ensure that your machines maintain the highest level of performance, avoid unnecessary breakdowns, and receive the best factory-authorized service you can find in Pasadena. They also include ongoing access to our product trainers and technical help desk. Additionally, Advanced Office has an in-house IT team that can help you further optimize your workflow through cost-effective software solutions. Call Advanced Office today for Pasadena's best value in copiers and printers: We are your source for honest copier/printer recommendations, competitive pricing, 100% financing options, and high-quality products and services. Advanced Office specializes in leasing, selling, renting, and servicing Ricoh and Lexmark commercial-grade copiers. Copiers not only play a key role in many businesses but also play a large part in how much money they spend on their print-related costs. At Advanced Office, our job is to help you find the precise copier models for your Pasadena company's unique needs. Copiers vary greatly in terms of size, speed, print resolution, features, and capacity, and the key is to determine which copiers meet your exact needs--no more, no less. By conducting a thorough worksite analysis, we ensure that your copier meets your current and future print-related needs without having you pay for features or capabilities that you don't need. Call and speak with an Advanced Office sales consultant today; we'll schedule a free analysis at your Pasadena site. With Ricoh and Lexmark's exceptional products and our competitive rates and personalized service, Advanced Office is Pasadena's best choice for commercial printers. 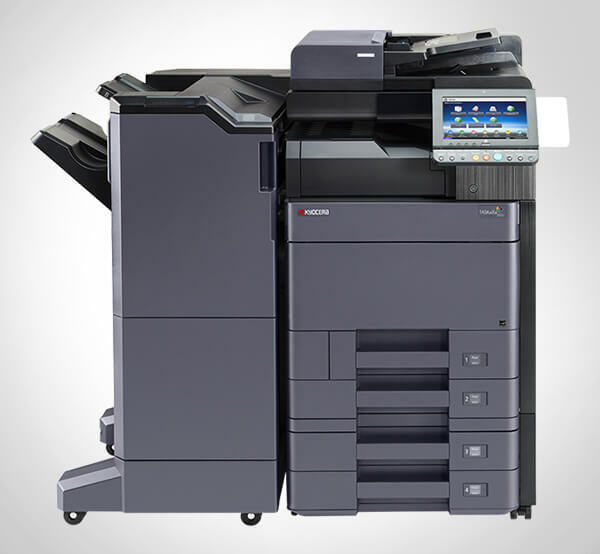 We lease, sell, and rent single-function and multi-function printers that can print in color, black and white, or both. 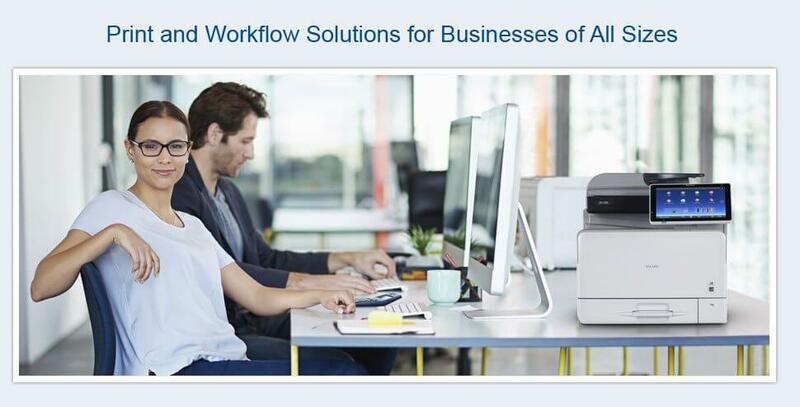 Our printer selection consists entirely of Ricoh and Lexmark machines because they are incredibly reliable, offer reduced printing costs, feature fast print speeds, and can be seamlessly integrated with custom software for innovative document management solutions. Call today to schedule a free onsite comprehensive analysis at a time that is convenient for you. Our printer experts can be trusted to design a custom print solution for your Pasadena business. Advanced Office has provided thousands of businesses across Southern California with our certified refurbished Ricoh copiers. Pasadena companies often call us to find out what we have in our refurbished stock because this inventory changes so frequently but is so cost-effective. Our refurbished stock consists primarily of our gently used, well-maintained copiers coming off of our short-term leases. We strip them down, clean them, and replace all of their high-wear components. We then conduct a 60-point inspection before certifying them for resale and qualifying them for our all-inclusive service contract. Call today to discover what we have in our refurbished stock and to determine if buying a refurbished Ricoh copier is the best choice for your needs. Advanced Office sells, leases, and services Ricoh, Lanier, and Savin digital duplicators. Digital duplicators are a favorite among Pasadena area schools, hospitals, churches, not-for-profits, universities and other select organizations because they make it possible to generate extremely large volumes of prints at a very low cost-per-page. Because digital duplicators make use of a spinning drum, ink and stencil, instead of toner, they make it possible to produce huge quantities of single-page (usually black and white) documents quickly and at a very low cost per page. Call today and learn more about the benefits of our digital duplicators as well as our service and financing options. 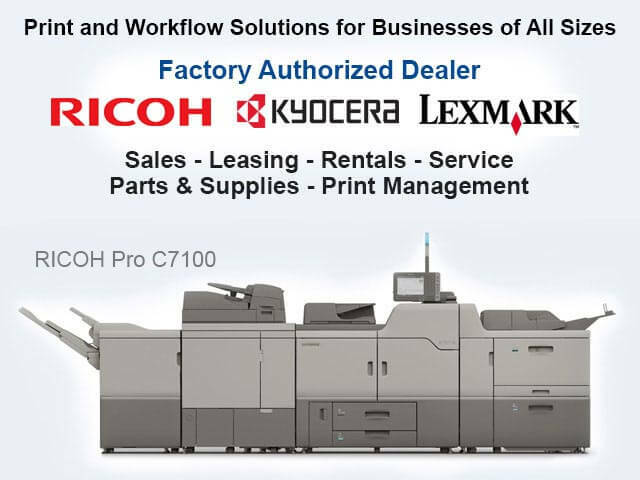 Advanced Office sells, leases, installs and services Ricoh's complete line of commercial production printers. A large number of Pasadena businesses prefer Ricoh's production printers because they are highly durable, offer excellent image quality, and have exceptionally fast print speeds. These high-production machines are built to produce large quantities of high-resolution prints quickly and cost-effectively, allowing companies to manage their own in-house print shop. Production printers can feature a wide variety of finishing options, such as stapling, folding, collating, saddle stitching, and hole punching, and be installed with automation software for added productivity. To learn more about these exceptional printing machines, call Advanced Office's experts for a free consultation and quote. We're Pasadena's preferred source for Ricoh wide-format printers (aka large-format printers). Wide-format printers are designed to quickly and cost-efficiently print, scan, and copy oversized documents. We provide 100% financing for businesses that wish to buy or lease one of our Ricoh wide-format printers, ideal for low- to medium-volume users. Call today to schedule your free onsite analysis; we'll provide our professional advice on the best wide-format printer for your needs and budget as well as information on all of our financing options. We think it is important to take a few moments to commend Mr. Pham for his always timely, helpful and knowledgeable service. Just as important, Mr. Pham always has a smile . . .